High growth of more than 6% in 2017, but economic fundamentals still show some weaknesses and Vietnamese businesses suffer from limited access to capital. The territorial dispute with China over conflicting claims in the South China Sea remains a serious issue in the bilateral relationship. In order to counter growing Chinese assertiveness, Vietnam is keen to improve its political and security cooperation with the US and Japan. However, Vietnam lacks the military capability to pose a serious challenge to Chinese actions, and its manufacturing sector depends heavily on raw materials imported from China. Moreover, given the ideological similarities of the regimes in both countries, there is still a strong pro-China faction within Vietnam’s Communist Party. Since the early 1990s the government has been very open to international trade and investment. Foreign direct investment in Vietnam reached a record level in 2015, and foreign investors are responsible for about 25% of annual capital spending. Trade accounts for about 150% of national output. 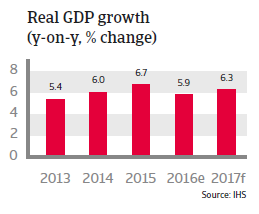 Real GDP growth is expected to increase above 6% in 2017, as agricultural output is picking up again after a drought and exports will grow further, since Chinese merchandise is being substituted by cheaper Vietnamese products. Private consumption growth is supported by low inflation, low local interest rates and rising wages. The persistently high inflation (with double-digit rates in 2010 and 2011) has, since 2013, finally decreased, enabling the central bank to lower the benchmark interest rate to the current rate of 6.5%. 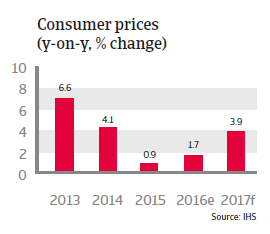 Inflation is expected to increase modestly in 2017 as the dong continues to depreciate and food prices rise. Fiscal consolidation will progress only gradually with the budget deficit expected to remain at around 4.5% of GDP in the near term. Increasing tax receipts are counterbalancing infrastructure investments and growing welfare costs. Access to credit in order to fund these deficits is not a short-term concern. Government debt is forecast at around 55% of GDP in 2017. 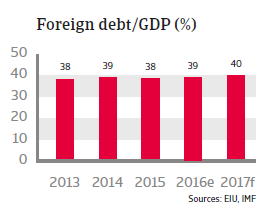 Foreign debt remains manageable at 40% of GDP and 38% of exports in 2017. More than 80% of external debt is long term, and debt service is low. While foreign exchange reserves are sufficient to cover the external financing requirements, at just about three months the import cover remains poor, and liquidity shortages cannot be ruled out. However, given Vietnam´s limited international financial integration, sharp exchange rate devaluations are unlikely. 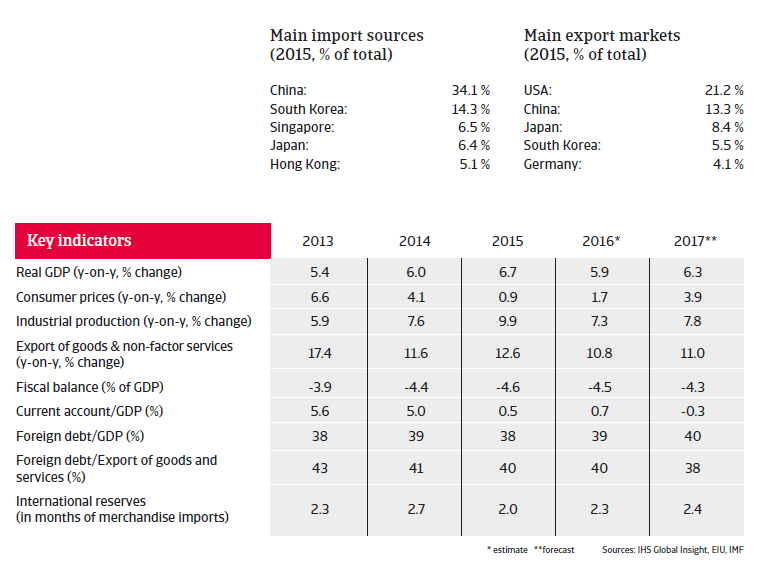 Vietnam is highly dependent on Asia as an export market (50% of deliveries), and therefore remains susceptible to economic downturns in the region. Vietnam was supposed to be a major beneficiary of the US-led Trans-Pacific Partnership (which would have led to a significant increase of its medium-term growth prospects), but the decision of the US administration to withdraw from the agreement has left its future in limbo. 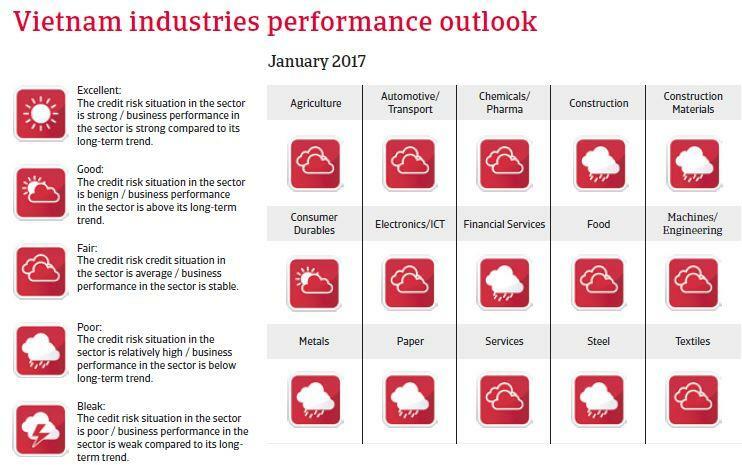 While the business environment is slowly improving, it continues to be hampered by weak institutions, infrastructure issues and endemic corruption. The level of state intervention remains high, and many of the state-owned enterprises (SOEs) are inefficient, hampering productivity increases. 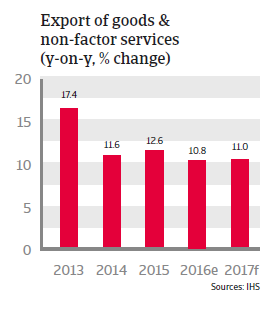 While the government has recently increased its efforts to reform SOEs by selling shares, productivity of the private sector remains poor compared to Vietnam´s Asian peers. The Vietnamese banking sector suffers from low transparency, weak capitalisation, state intervention and a high rate of non-performing loans (estimated at about 12%), due mainly to politically motivated lending. The government has been slow to inject new capital into the financial sector and hesitant to modernise their operations. Vietnamese businesses suffer from limited access to capital, making it harder for them to compete internationally. The flaws of the banking sector and limits on foreign ownership hamper efforts to attract more foreign capital.